It’s always a challenge when you’re on a diet. I’m going no alcohol and low-carb to lose some weight. (Down 6 lbs. in 5 days so far.) My wife needs to include gluten-free food in her diet, though she can have a few carbs. Fish is a great source of protein, and we love it sauteed in a little butter and olive oil with Paul Prudhomme’s Seafood Magic seasoning on it. But let’s face it, that gets old after a while, and we all know there’s nothing tastier than fried fish. 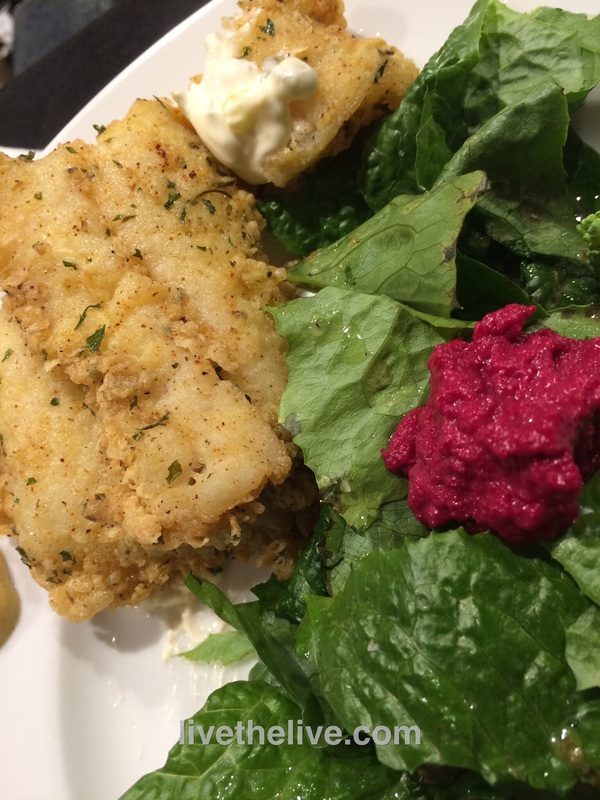 Rather than using a heavy beer batter like I used to do (damn good and easy to do:http://wp.me/p1c1Nl-en), I came up with a very light gluten-free-flour-based seasoning that gave the fresh-caught local fish we bought incredible flavor and crunch without a carb overload and without gluten. Damn good, and I have to say, you’d never know the difference. There are many gluten-free flours out there now, and all you need to do is substitute them cup-for-cup in any recipe you have. I’ve tried Bob’s Red Mill (OK), King Arthur (better), and Pamela’s (very good–what I used for this recipe.) I’ve just ordered the latest: Cup 4 Cup, created by chefs that include the famous Thomas Keller, which we tasted at Mario Batali’s Del Posto restaurant in New York City recently. They have about 12 different pasta dishes on their menu, and each one has a gluten-free option using the Cup 4 Cup flour. They were fantastic! In a flat bowl you will use to dredge the fish fillets, combine the flour, salt and pepper, parsley, oregano, granulated onion and garlic, and paprika. In a separate flat bowl, scramble the 2 eggs. Pour about 1/2″ of the oil in a pan and heat to medium-high heat. Dip the fish fillets first in the eggs, coating well. Then dredge in the flour mixture, pressing down on both sides, so the flour mixture really sticks to the fish. Then shake the fillet lightly to remove the excess flour and gently lay the fillet in the hot oil. Fry until golden. We made a quick and delicious tartare sauce using mayonnaise, dill pickle relish and Maille sauterne mustard.